Since version 1.3, Menelic Visitor is able to send visit notifications to a Microsoft Teams channel. Now navigate to you Menelic Visitor Admin Dashboard and in the “Locations” section, you will need to specify the Location Manager Name. 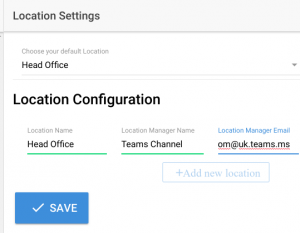 In the “Location Manager Email” field, please enter the Microsof Teams Channel Email address copied in step 1 above and click save. Note that the email address should be not have any space or name in it.For instance if you copied “Menelic Visitor – Employees <aaabbb222.somedomain.onmicrosoft.com@uk.teams.ms>”, the email adress should be “aaabbb222.somedomain.onmicrosoft.com@uk.teams.ms” without the quotes. 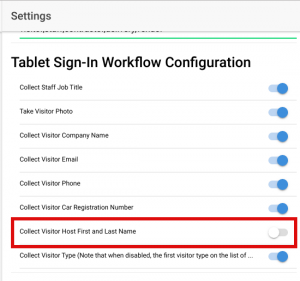 Next, we need to disable visitors having to choose the host they are visiting so that notification do not get sent to the host but goes straight to the Location Manager we have set up earlier.